Women in investigative journalism face unique challenges in their everyday lives. Women in investigative journalism do not only deal with the dangers that come with investigations, they also have to deal with male-dominated workplaces and sexual harassment. This was the central discussion at the Challenges of being a Woman Investigative Journalist session at the African Investigative Journalism Conference 2018 (#AIJC18) on Wednesday, October 31, at Wits University. The talk kicked off with Motunrayo Alaka, a Nigerian journalist who leads the Wole Soyinka Centre for Investigative Journalism. She expressed concerns over how women are represented, treated and recognised in the newsroom. “A lot of women are considered quiet and hardworking but a lot of women do not make it to the editor-in-chief position,” Alaka said. “The perception is that if you are vocal, you are aggressive,” she said. Motunrayo Alaka, right, says women need to be clear in saying “no” when men overstep boundaries. Photo: Sanet Oberholzer. 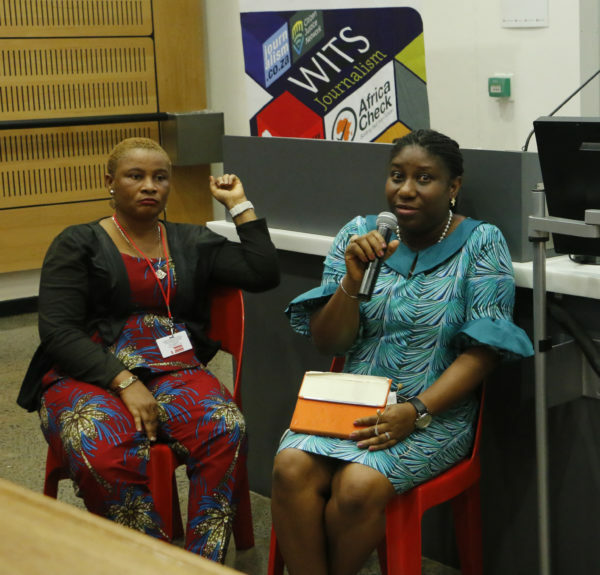 Alaka was joined on the panel by Juliana Francis, the crime editor for the New Telegraph in Nigeria and Pauli Van Wyk, an investigative journalist for the Daily Maverick. Francis said she found it challenging to be a mother and follow through with investigative stories that she wanted to pursue. “There are so many stories I want to do, but can’t because of my kids. I did an investigative story for two years and it was very difficult for me to leave my kids to travel to different states,” she said. Being intentional in decision making was one of the key ways discussed to address the challenges confronting women in newsrooms. According to a 2017 survey conducted by the American Society of News Editors on the leadership of women in newsrooms, only 38.9% of newsrooms in the US had leadership positions held by a woman. Wits Vuvuzela Anas on journalism: ‘Naming, shaming and jailing.’ October 2018. Wits Vuvuzela Data collection no longer complicated October 2018. Wits Vuvuzela Fact checking celebrated at Africa Check awards October 2018.